In a candid conversation with Mayur Patel, author of the book Scarlet Nights. The story of the book is about humans and their situational behavior, their adventure and the lack of certainty, their liking and their experiences, their mind and it's quality to explore, exploit and be enamored at various things and many such other attributes. 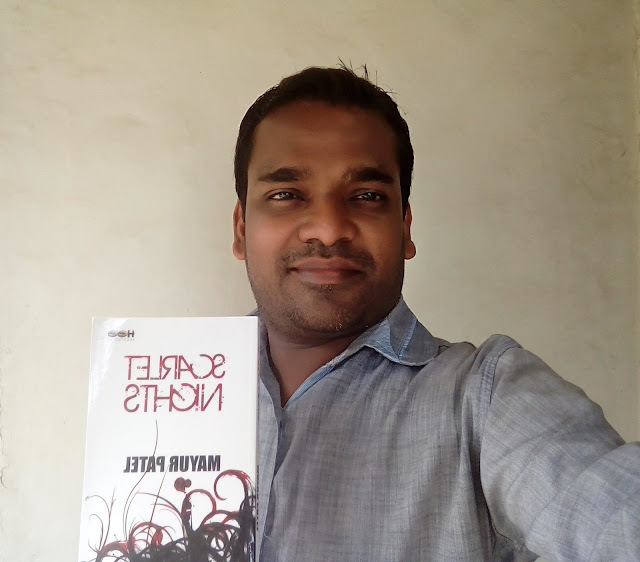 To read the complete book review, visit Book Review : Scarlet Nights - Mayur Patel. Q: “Scarlet Nights”, how did you come up with the title? You thought of the title first and then wrote the story or it was the other way around? A: I believe that your favorite color reflects your personality to some extent. The color ‘Scarlet’ has got an important role in my book ‘Scarlet Nights’. It represents the mood and the nature of one of the main characters, I won’t tell which one. It’s a secret. I had thought of this title at an early stage of the writing, don’t remember exactly when. Q: “Scarlet Nights” is your second book, or as per your Facebook update you prefer calling it your second child, how does it feel holding it? A: Seeing your hard word in a book format is always a very satisfying feeling. It’s really a very proud moment for me. However, let me confess that, this time, I am not as emotional as I was when my first book was published. Your first time always remains extra-special, doesn’t it? A: I think I was born to be a writer. There has always been a storyteller inside me. The neighboring kids and my classmates loved to listen to the stories I told them. Loaded with exaggerations and animated sounds, my stories were quite popular. I started to read Gujarati novels at the age of 10 and tried to pen the first novel of my life when I was 12. Needless to say, it was a mere copy of the authors I used to read. I kept attempting to writing novels (in Gujarati and Hindi) for years and finally succeeded in finishing one at the age of 17. Though it never got published, it gave me a confidence that I can write a full-length novel. Years went by, I kept reading novels in Gujarati, Hindi and English, and then came a day in the year 2004 when I started to write my first English novel, a horror thriller titled ‘the woods’. That one also didn’t get published. It was the year 2006 when I began writing ‘Vivek and I’ which later was published by Penguin Books India. And then happened the latest one, ‘Scarlet Nights’. Q: Tell us something about your experience of getting “Scarlet Nights” published. A: It’s been a long journey. The book was rejected by some publishers for the boldness it holds. Then Suhail Mathur took my book in his hands as an agent and found me a good deal with Half Baked Beans. The editing process was long and educative. We trimmed the story, re-wrote some portions and came up with the crispest possible version. Q: Tell us something about the cover of the book? A: It was I, my publisher and the cover designer ‘The Book Bakers’ who worked together to come up with a nice cover. Several options were tried but somehow one or the other didn’t find them attractive enough. Then I came up with this image of the entangled hair and suggested the blood stains which worked favorably and thus came into existence this enticing cover. A: At present I’m associated with a media firm in Surat, Gujarat. Q: Apart from “Scarlet Nights”, have you written anything else? What can we expect from you in the near future? A: My first book was ‘Vivek and I’ which was published by Penguin Books India in 2011. My next release is a Gujarati novel ‘TarpanYatra’, which is the first ‘Travel Novel’ written in Gujarati. It will be released within a month or two. In English, I am writing an Epic Fantasy Saga which is a mixture of Fantasy, Indian Mythology and Science Fiction. An action-packed adventure, it’ll have interesting subplots and a lot of characters. Q: The story of “Scarlet Nights” has got many characters. How did you think about all of these characters? A: I had to be very careful while carving some characters. They required having similar traits, and at the same time, they should be different too. Why so..? Well, you have read the book, so you know it well now. It took an extra effort while giving them the characteristics they possess. Interview with Mayur Patel, author of the book 'Scarlet Nights'. Q: Is the story of “Scarlet Nights” inspired from real life events; is it completely real or completely fictional? A: ‘Scarlet Nights’ is pure fiction. However, I have taken inspiration from real life people while creating the characters. I have a habit of observing peoples’ behavior; which helps me a lot in carving the characters of my novels. The characters of Malvika Chauhan, the protagonist of ‘Scarlet Nights’, is heavily inspired from Priyanka Chopra’s personality. While the background of Mumbai and the daily routine described in the narratives are kept close to reality, the plot is completely fictitious. A: It took me nearly two years to complete this book. I don’t have a writer’s block but my writing is driven by mood swings. I love writing so much that I don’t think I’ll ever have a writer’s block. Q: If “Scarlet Nights” is made into a Bollywood movie, which actors/actresses would you want to be a part of it? A: As I have already said I took inspiration from Priyanka Chopra’s personality while creating the main character of the novel so I would love to have her play the role. For Manav’s role, Sushant Singh Rajpoot will be a good choice. John Abraham or Vidyut Jamwal can be Shikhar Dhawan. And for the rest of the cast, including Margrita, I better keep mum. You know why, don’t you? A: I read more than I write. I think most writers read more than they write. That’s how it should be. Reading is what matures a writer. I have read many authors, Indian and International, but the two who inspired me and taught me the most about writing are Sidney Sheldon in English and Harkisan Mehta in Gujarati. My favorite Sheldon books are ‘the best laid plans’ and ‘the sky is falling’. My favorite Mehta books are ‘Dev-Danav’ and ‘Lay-Pralay’. I loved Paulo Coelho’s ‘the winner stands alone’, Arundhati Roy’s ‘the god of small things’, and Indira Goswami’s ‘an unfinished autobiography’. A: I love paperbacks. E-books can’t give you the feeling of holding a physical copy. I love the smell the virgin pages offer. Q: Two things that you like and dislike about “Thrillers”? A: I love this thing called ‘Mystery’. Most thrillers have got some kind of mystery which is the best thing about them. The aspect of ‘Drama’ is often neglected in Thrillers, which I dislike. To maintain the pace in a thriller, most authors avoid necessary narratives, too. I disliked it when the characters are not well-defined as compared to the plot. Unnecessarily long action scenes also put me off. Q: If you have to give one reason to our readers to get hold of your book, “Scarlet Nights”, what would the reason be? A: ‘Scarlet Nights’ is a psychological thriller. How many psychological thrillers do we have in India so far? Very few! So it is the genre that makes this book special. Another unique element about this book is that it takes the readers deep into human psyche where they get to learn a lot about the hidden traits of human psychology. Almost all the reviewers have specifically mentioned this in the reviews. ‘Scarlet Nights’ deals with something which has hardly been attempted by any Indian author. Go through the reviews of my book and you won’t resist buying it. A: Buy original books, not pirated. Support aspiring authors. And read at least one book in a month. A: I can be contacted at markmayur@gmail.com and on Facebook, Twitter, Instagram and Google+. Thank you Mayur, for the interesting answers.